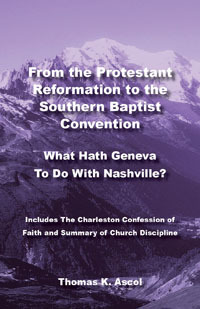 In 1996 Founders Press began with the publication of my little booklet, From the Protestant Reformation to the Southern Baptist Convention: What Hath Geneva to Do with Nashville? I wrote it in part to respond to the widely-held assumption (and often-repeated refrain) that “Southern Baptists have never been Calvinists.” Founders had been making that case for years but I thought it might be helpful to have an accessible, documented overview of it. Though today that assumption is hardly ever heard in reasonable historical and theological discussions about the SBC, there is still a need a concise statement of the doctrinal background of the SBC. Several years ago the late Roger Nicole encouraged Founders to reprint it even sending an unsolicited “Introduction” that he urged us to use. Due to other pressing concerns, this project kept being put on the back burner. Today I am pleased to announce that the electronic version of a new edition of From the PR to the SBC has been released. A print copy is scheduled to be released by the end of the summer. In the new addition copies of the Charleston Confession of Faith and Summary of Church Discipline are included as appendices. For more information, commendations and download instructions, go here.